I'll preface this by saying what I'm writing here is not a review so much as it is a discussion of if the, "Cloverfield," brand in the title helps or hurts the film--and there are plentiful spoilers about the ending, but honestly, if you know anything about the original, "Cloverfield," movie that came out long ago much is already spoiled for you. 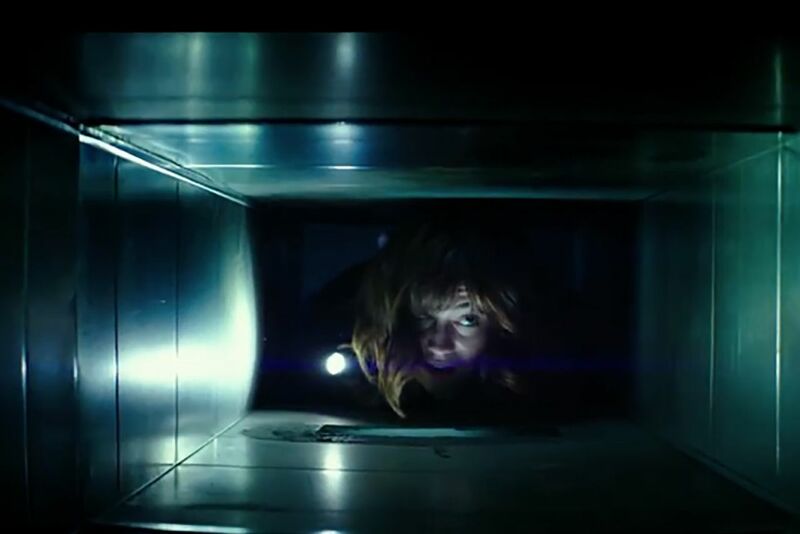 "10 Cloverfield Lane," after a quick opening ,becomes an intense psychological thriller about three people stuck in an underground bunker together, with one quite clearly in charge (Jon Goodman). It's at times scary (Goodman is imposing), at other points heartwarming (Mary Elizabeth Winstead and John Gallagher Junior's character strike up a sweet friendship). You wonder who is telling the truth, how violent things could get, and otherwise are at the edge of your seat. Then Winstead's character escapes with 15-ish minutes left in the movie and suddenly it becomes a sci-fi action flick where she fights some aliens. It is a bit of a jarring shift in tone but the earlier 9/10th of the movie help make-up for how it feels like they just haphazardly stapled the end of a completely different film onto this one. That isn't even a joke, Producer JJ Abrams (whose production company created the first, "Cloverfield,") made this movie by taking much of the script of a different film and changing it to fit as a spiritual-successor of sorts for, "Cloverfield." The small cast accomplishes a lot. Ah, there's the crux of it. This isn't really a, "Cloverfield," sequel, nor does it have the same aliens. Hell, this may not even take-place in the same movie-Universe. No, if anything, "Cloverfield," is a theme and from what I've seen in interviews it seems like Abrams idea is to have movies take place under the, "Cloverfield,"style of banner where they link-up thematically, even if they are completely separate movies--sort of the idea that was had to do with the, "Halloween," series starting with the 3rd entry of the franchise (but in this case without wholly failing). Were, "10 Cloverfield Lane," simply, "The Cellar," or any other name, it maybe wouldn't have gotten the attention it did--which would be a shame as the other big point to make is that this is a really good and quite scary movie...at least until that last bit where things get weird. 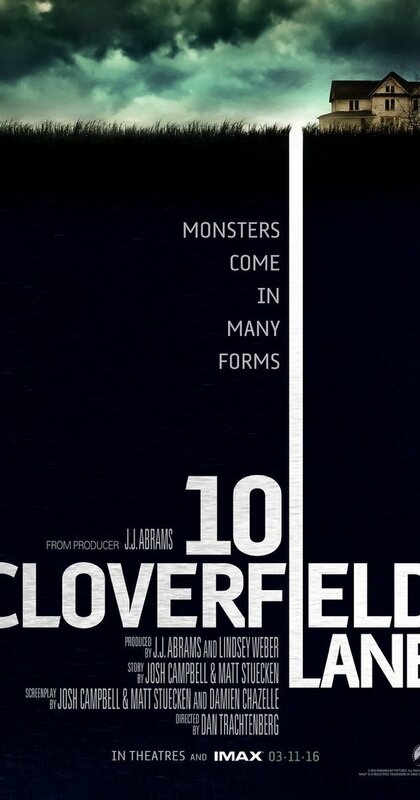 The biggest problem this movie has is that with the word, "Cloverfield," in the title we already know the person who claims something bad is happening up top is correct. The words sandwiched between "10," and, "Lane," make that abundantly clear. The parts of the movie featuring everyone stuck together underground are so claustrophobic, intense, and otherwise terrifying that once things open-up onto the surface it just feels like a completely different movie that still has the same main character. To director Dan Trachtenberg's credit, he doesn't let this late-swerve in the story ruin our fondness for the other majority of the movie, and the last parts aren't even bad--they just really don't feel like they belong in the same damn movie other than because of the rules imposed by that C-word in the title. It's literally a claustrophobic film till sudden changes at the end. "10 Cloverfield Lane," is a strange beast, feeling like one kind of film most of the time and suddenly morphing into something else at the end. To its credit the impressive nature of everything that comes before it all gets weird results in a movie that I still would recommend watching--even all the way through to its foregone conclusion of, "Hey, the aliens are here after all!" Still, the overall idea that the worst monsters may be the people we think we know (Jon Goodman does not play a nice person in this) is apparent no matter how bizarre the flick gets. So yes, issues with how it goes bonkers aside, I liked this, and think you might too. Best case scenario you love it and defend it against criticism, or worst comes to worst you can always join the backlash.